The action then moves to New York City as said boat drifts into the harbor, no one at the helm. When a couple of harbor patrolmen investigate, they soon learn that the reason Renard shot the guy in the head is that he was a zombie. They also learn that Renard must not have been too thorough, as another zombie on board (presumably the one who ate the crew) attacks and kills one of the patrolmen. So begins one of the most successful rip-offs in movie history. 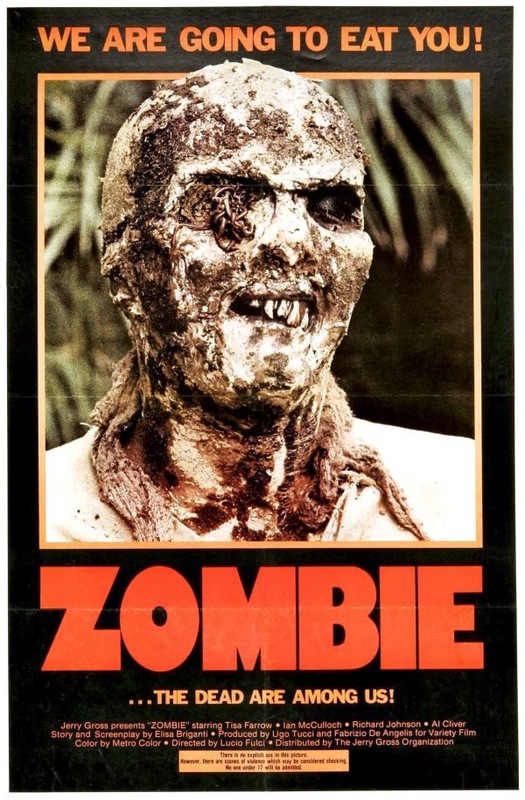 Released in Europe as ZOMBI 2 in an attempt to convince moviegoers that what they were seeing was a sequel to George A. Romero's DAWN OF THE DEAD, which played pretty much everywhere but America under the title ZOMBI, Fulci's quickie imitation nonetheless manages to distinguish itself in a number of ways, even if it can't hope to hold a candle to its inspiration in traditional terms of cinematic quality. 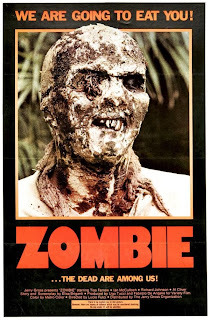 Unlike Romero's siege-based zombie films, Fulci's utilizes more of a mystery/intrigue plot. The daughter of the owner of the boat from earlier in the film, Anne (Tisa Farrow, sister of Mia), wants to find out what happened to dear old dad. So does Peter West (Ian McCulloch), a reporter at a New York paper. After a meet-cute while surreptitiously checking out the boat at night, the two team up and head off to find the tropical island of Matool, last known whereabouts of Anne's father. There aren't any commercial boats available, but Anne and Peter manage to convince vacationers Bryan (Al Cliver) and Susan Barrett (Auretta Gay) to give them a lift. On the surface, everything looks like sun and fun, but death and horror await. And boy, what a catalog of death and horror ZOMBIE has to offer. We've got an underwater zombie attack that turns into a battle between the zombie and a shark; we've got a great big hunk of jagged wood jammed right into a woman's eyeball by a zombie; we've got heads split open so thick, chunky cranberry sauce can spill out; we've got zombies with live worms crawling in their eyesockets and mouths; we've got great bit bites of flesh taken out of multiple cast members; and of course, plenty more gory head shots. Cinematographer Sergio Salvati's camera never flinches, and unlike Romero's fast-cutting style, Fulci prefers long, lingering takes to allow his audience to better savor the special effects work of Gianetto Rossi. Subtle it ain't. That said, the narrative is actually pretty strong, especially given the usual nonsensical “nightmare logic” scenarios found in most of Fulci's other horror films. While there's no doubt this is a film intended for the bloodthirsty exploitation market of the seventies, there's enough character development and at least passable dialogue to give the strong cast of veteran, if B-list, actors something to chew on. Fulci's admirers have a tendency to oversell the filmmaker's virtues. He's no maestro of the macabre like Mario Bava or Dario Argento, but he is a competent filmmaker who knows how to deliver the goods in an entertaining way, and can usually be counted on to generate considerable atmosphere in his horror films. At the end of the day, though, if you're not a gorehound, there isn't much to his work, ZOMBIE included, that can be called exceptional. Provided you're not too squeamish, though, ZOMBIE has much to offer in terms of fun and thrills. 3 out of 4 stars.